DIE Veneris, 9 die Novembris. E. of Lincoln, Leave to be absent. Message from H. C. for Committees to meet, to examine Public Accompts. Dodford, who arrested Spurrier his Servant, released. The House being informed, "That the Earl of Lyncolne hath obtained Leave from the King to go into the Country for his Health," their Lordships likewise dispensed with his Absence. The House was adjourned into a Committee of the whole House, to consider further of the Bill against importing of Irish Cattle, &c.
And, after a serious Debate, the House was resumed. 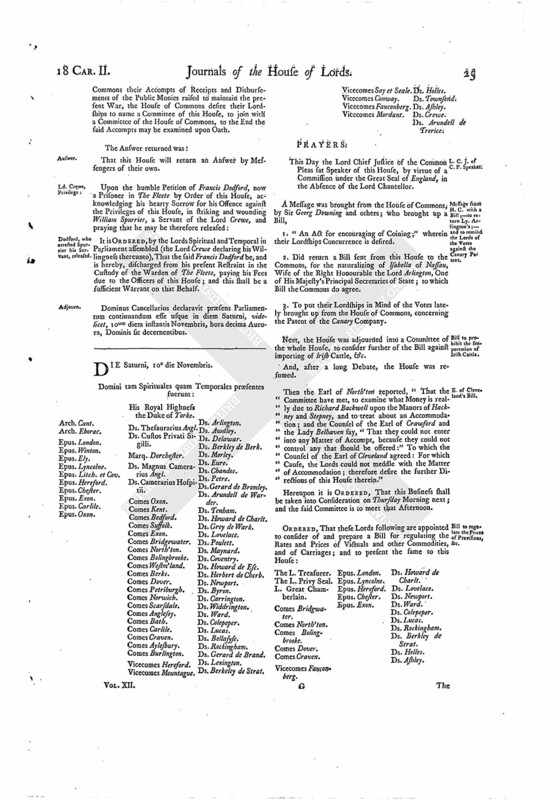 That His Majesty having been graciously pleased to command His Officers to bring into the House of Commons their Accompts of Receipts and Disbursements of the Public Monies raised to maintain the present War, the House of Commons desire their Lordships to name a Committee of this House, to join with a Committee of the House of Commons, to the End the said Accompts may be examined upon Oath. That this House will return an Answer by Messengers of their own. 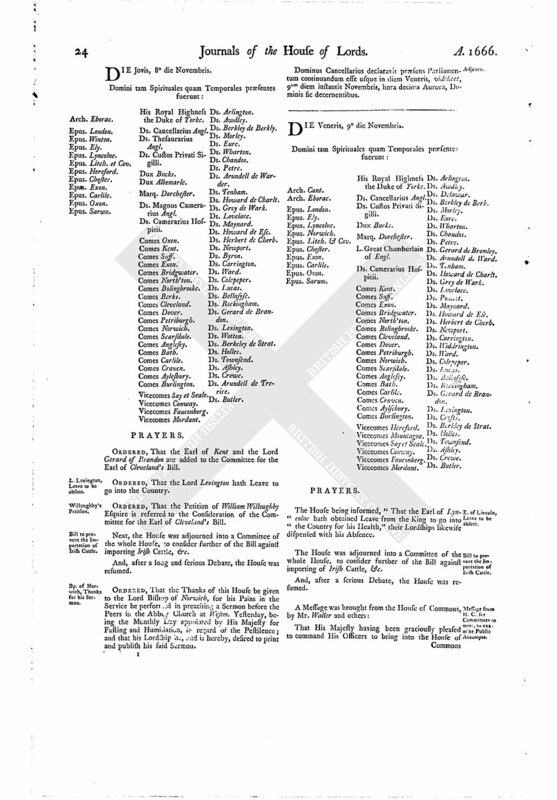 It is ORDERED, by the Lords Spiritual and Temporal in Parliament assembled (the Lord Crewe declaring his Willingness thereunto), That the said Francis Dodford be, and is hereby, discharged from his present Restraint in the Custody of the Warden of The Fleete, paying his Fees due to the Officers of this House; and this shall be a sufficient Warrant on that Behalf. Dominus Cancellarius declaravit præsens Parliamentum continuandum esse usque in diem Saturni, videlicet, 10um diem instantis Novembris, hora decima Aurora, Dominis sic decernentibus.